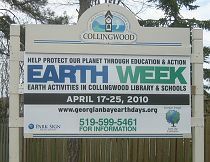 Collingwood and area joined the world on October 10, 2010 to be part of the Global Work Party with 7347 groups in 188 countries to bring attention to the climate crisis that most assuredly will intensify throughout the 21st century unless we change now how we locally and globally think and act. The aim of this grassroots effort was also to tell governments that they have to get to work-now. What we did in Collingwood on October 10th was to first go to our Community Garden and pick some of the vegetables and turn over the earth. An art project was held at the garden with Michelle Fleming of The Bay School of Art. We ended the afternoon by planting 45 two foot trees at Black Ash Creek. Imagine 7347 creative work efforts on October 10 that aimed to inspire us to lower greenhouse gas emissions and have millions of voices saying to our politicians that it’s unacceptable not to point government polices towards a safe 350 parts per million carbon dioxide level for the world. By including many more people through various strategies, we’ll change the present political inertia into action for the stabilization of our climate with all the ramifications that holds for biodiversity and not least, indigenous populations. One strategy to move this grassroots ground swell of support along is to have the 350 Earth Project that will take place between November 20- 28th. If you look at the word, “Earth” you can find the word. ‘Art’, and in the Grey/Simcoe counties we’ll be asking our artists to demonstrate through the arts what needs to be done for a reduction of carbon to 350 ppm. How can this take place? At the “Be the Change” film series on November 24th, there will be photos shown of the most beautiful places on the Earth; places that we don’t want to lose. Live music will accompany those exquisite photos. The Bay School of Art is also going to have a creative arts event during this time period that visually presents the case to act on climate and lower our greenhouse emissions to 350. I wish to address another important topic that impacts our community: the changes coming to the Silver Creek Wetland. Although a change of ownership of the wetlands to the Town is excellent news, not necessarily is a twig saved by doing so. What is frequently left out of the news reports is that the condo development, that is right in the middle of the wetlands, can proceed whether or not the remaining wetlands change hands to the Town of Collingwood. As well, the transfer of ownership may in fact give traction for the need to have the public ‘get something out of the deal’ such as trails where none may have been before. 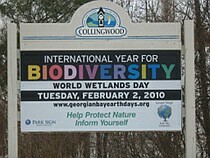 I see this transfer as a beginning and not as an end for better protection of the wetlands. Perhaps it may be possible to persuade TD, who is the new owner of the upland condo development, to give those lands to the Town or to a conservation group such as the Nature Conservancy as well. Why not name the entire wetland, as one of many possibilities in return for such an act of wisdom and conservation foresight, ‘TD Trust Wetland Refuge’ or any other name that meets with their approval, and gives them a broad public acknowledgement of their generosity. So while a good start has been created for Silver Creek’s protection, a comprehensive vision should not stop there. Good Work and Dedicated People are Forging the New Alliance for the Planet. “The Empathic Civilization is emerging. We are fast extending our empathic embrace to the whole of humanity and the vast project of life that envelops the planet. But our rush to universal empathic connectivity is running up against a rapidly accelerating entropic juggernaut in the form of climate change … Can we reach biosphere consciousness and global empathy in time to avert planetary collapse? It’s the myriad voices and actions that are now coming together to create the difference between relentlessly pushing our planet’s biosphere towards a collapsed, unrecognizable place and forging a balanced ecologically sustainable Earth that makes our times so fraught with anticipation. Bill McKibben, arguably the most influential Nature activist in the world, has written a book called “Eaarth” with two a’s signifying the massive changes that are now moving our planet towards a terrifying and perhaps uninhabitable new ‘Eaarth’. Will we have to redefine the very basis of humanity’s existence on this planet, and therefore should we call it by a new name? Bill tells us that the planet has already changed and that we must take action now so creative steps find strength in worldwide collective grassroots efforts. There is good news. While attending a climate action meeting for two days last month it came to light that a new poll tells Canadians that 48 percent of us believe the climate issue to be very important and very urgent to solve, while 80 percent of Canadians feel that humans are at least partly responsible. It’s when we get to the age groups and genders that climate activists know where the work is cut out for them: 54 percent of women and 45 percent of men under 35 believe that climate change is caused primarily by human activity and it is only in the last two years that most young women have become involved In working for a climate solution. Unfortunately a majority of men between the ages of 35-54 did not feel it was very important for the world to find solutions to climate change. Strategies to work more diligently with already involved women to instill faster change in the population are a priority. Our community is answering the call to work on finding solutions enabling a more resilient planet. The arrival of author Mike Nickerson in Collingwood last week was met with excitement. His book,” Life, Money and Illusion: Living on Earth as if We Want to Stay” is already in its second printing. He asks,” Might the goal of sustainability serve the needs of humankind better than the goal of perpetual economic expansion?” Mike met with Collingwood Collegiate students and then with members of the Transition Town group that is dedicated to bringing about the localization of food production and the reskilling of young and old to better be able to live in a world without globalization, and where the community becomes more self-reliant. Earlier in the week a group of citizens started the Collingwood Food Alliance. It’s first two initiatives is to bring about the wide spread use of our new community garden and to bring back local farmers to the Saturday morning market. Next week brings climate justice groups to Toronto on November 13-14. In September, 850 people came to hear James Hansen, the climate scientist from NASA, speak at University of Toronto. The grassroots movement is gaining momentum and it’s ready to change status quo destructive politics and corporate agendas forever. Join us.